U.K. officials are examining the sale of complex hedging products to small business by HSBC, Barclays and two other major banks. For U.K. banks, 2013 is beginning just as last year ended -- with another review of misconduct that could cost the four market leaders at least $1 billion in payouts. Following an investigation, HSBC (HBC), Barclays (BCS), Royal Bank of Scotland and Lloyds have agreed to examine the sale of thousands of complex interest rate hedging products to small businesses that neither fully understood them nor needed them, and provide compensation. "Small businesses will now see the result of the review as the banks look at their individual cases," chief banking regulator Martin Wheatley said in a statement. "Where redress is due, businesses will be put back into the position they should have been without the mis-sale." The interest rate swap scandal is the latest example of unethical or illegal behavior by the banking industry. 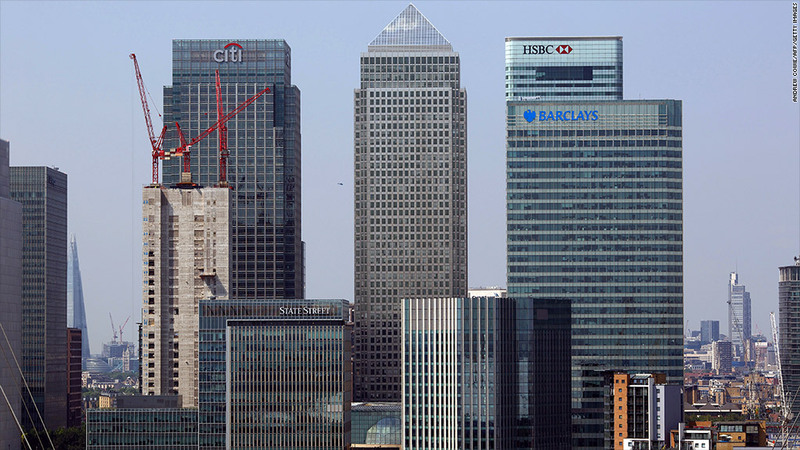 Banks have paid out billions of pounds in compensation, settlements or fines related to the mis-selling payment protection insurance, manipulating Libor benchmark interest rates and breaching money-laundering rules. Bank of England Governor Mervyn King warned in November that U.K. banks may have to raise more capital because they weren't recognizing fully the cost of past misconduct, among other risks. The Financial Services Authority (FSA) found serious failings in the sale of interest rate swaps, which were supposed to limit the buyer's exposure to the rising costs of servicing loans by capping or fixing interest rates, or keeping them in an agreed-upon range. When rates fell, many companies were left with higher costs or punitive penalties for exiting the products, in some cases pushing them into bankruptcy. A review of 173 cases found that over 90% of the sales did not comply with at least one regulatory requirement, the FSA said in a statement. Bank staff, under pressure to hit targets, did not disclose exit costs fully, failed to make sure customers understood what they were buying and offered inappropriate advice, the FSA found. The four banks have already set aside over $1 billion and the cost may rise. The FSA estimates that some 40,000 interest-rate protection products have been sold to small firms. The FSA is currently reviewing sales by six other banks -- Santander, Allied Irish Bank, Bank of Ireland, Co-Operative Bank and Clydesdale and Yorkshire banks -- and hopes to reach agreement with them on compensating customers by the middle of February. To claim compensation, small and unsophisticated firms -- such as bed-and-breakfast businesses -- will have to show that the rate-hedging breaks' costs weren't clearly stated or the product was inappropriate for the size of the loan. Subsidiaries of multinational companies will not be eligible for compensation. "The announcement today will give clarity to businesses and will enable the banks to put in place the steps needed to resolve each case for customers," banking lobby group BBA said in a statement. "Where customers have suffered unfairly the banks have all agreed that they will put it right." But Mike Lloyd, director of a company that was placed in administration last year after being crippled by the costs of servicing -- then exiting -- a swap sold by Barclays, said he was concerned many businesses would miss out on compensation because of the way the banks and the FSA determined which firms were "unsophisticated". "We're very concerned we won't have any redress," he told CNNMoney. "We're concerned that they'll try to get away with it by hiding behind the sophisticated criteria -- to me it needs a fresh look." His company Sarumdale, which operated 23 pubs in the southeast of England, may miss out because it had more than 50 staff -- many of them part-time -- and revenue of more than £6.5 million, he said. "We had 3 full-time head office staff and the rest were in the pubs," he said. Lloyd said Barclays had made the interest rate swap a condition of a business loan in 2006. When interest rates collapsed in 2008, the cost of servicing the swap soared. Sarumdale sold property to try to stay afloat, and then ended up borrowing more money to buy itself out of the swap arrangement.